Additional Info: I am a highly experienced teacher with over 35 years of professional work in the media of performance, assessment and examination, especially undergraduate, postgraduate and professional performance. I will offer constructive, encouraging and supportive advice and I will always put your needs first. I was educated at Chetham’s School, RNCM, on postgraduate scholarships at the Conservatoire de Musique, Geneva and the Musikhochschule Frankfurt-am-Main and Edinburgh University. My principal teachers were Renna Kellaway and Joachim Volkmann and I received coaching from Vlado Perlemuter, Jorge Bolet, and Joaquin Achucarro. Following a successful formal debut, I worked widely throughout Europe for ten years as a soloist. I resumed performing as a result of encouragement from Murray Perahia (at the Centre for Advanced Studies, Snape) and Menahem Pressler (at the Centre for Music and Arts, Banff, Canada) and have since performed and recorded extensively for the BBC, in Germany, USA and Italy. A highly praised recording of the complete piano works of the Scottish composer Robert Crawford was released by Delphian Records in 2008. I currently combine a busy teaching schedule as Senior Lecturer and director of performance studies for the B Mus Hons degree course at Edinburgh Napier University, with frequent appearances as soloist and as chamber musician, including with the Edinburgh Quartet. I have considerable experience as an external examiner and adjudicator (Royal Conservatoire of Scotland, St. Mary's Music School, Dundee High School, Eton College, Windsor). I charge a basic rate of £45 per lesson. For this, I will address your specific needs and provide the facilities/resources for teaching. The lesson will be a generous hour. 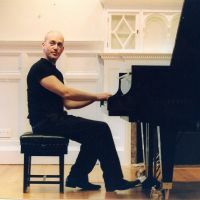 I no longer normally teach beginner pianists or ABRSM (or equivalent) grades 1-7. I will be happy to recommend specialist colleagues in these fields if you require advice. For ABRSM Grade 8, and ABRSM Diplomas (DipABRSM, LRSM, FRSM; also Trinity Guildhall, LCM equivalents) I charge for one hour lessons. I am also very happy to prepare students for final performance examinations at both undergraduate and postgraduate levels, and for specific performance events (recitals, concertos, chamber music and exceptionally for auditions and competitions). Any initial enquiries or discussion concerning an assessment of requirements are without obligation and free of any charge. I will charge for an initial assessment lesson.